Cilia on the surface of a developing mouse embryo. The cilia were colored red (artificially) after this image was produced via electron microscopy. 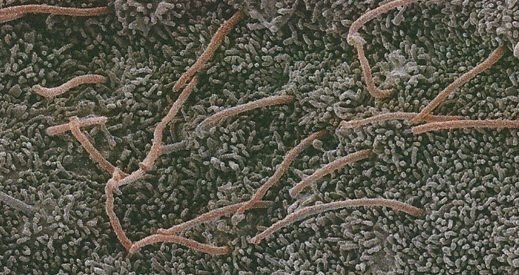 The smaller protuberances are microvilli. A new study demonstrates the dynamic role cilia play in guiding the migration of neurons in the embryonic brain. Cilia are tiny hair-like structures on the surfaces of cells, but in the brain they are acting more like radio antennae. In developing mouse embryos, researchers were able to see cilia extending and retracting as neurons migrate. The cilia appear to be receiving signals needed for neurons to find their places. Genetic mutations that cause the neurodevelopmental disorder Joubert syndrome interfere with these migratory functions of cilia, the researchers show. The finding suggests that problems with neuron migration may explain some aspects of Joubert syndrome patients' symptoms. The results were published Monday in the journal Developmental Cell. "The most surprising thing was how dynamic the cilia are," says Tamara Caspary, assistant professor of human genetics at Emory University School of Medicine. "As interneurons migrate into the developing cerebral cortex, they move in steps. When they pause, we could see the cilia extending, as if the interneurons are trying to figure out where to go next." The paper is the result of a collaboration between Caspary's laboratory and that of Eva Anton, professor of cell and molecular physiology at University of North Carolina School of Medicine. First author Holden Higginbotham, formerly a postdoc in Anton's laboratory, is now a faculty member at Brigham Young University in Idaho. Readers may be familiar with motile cilia, which can be found on a paramecium or in our trachea or reproductive organs. In contrast, primary (non-motile) cilia can be found on almost every cell in the human body, each cell having just one. Ciliopathies are a class of genetic disorders involving defects in cilia, and include kidney and eye diseases as well as Joubert syndrome. Joubert syndrome affects the development of the cerebellum and brain stem, leading to lack of muscle control (ataxia), breathing problems, and sometimes intellectual disability. Caspary's laboratory has been studying Arl13b, a gene mutated in Joubert syndrome. Mutations in Arl13b lead to cilia that are short and stubby. "It's a useful tool for studying the role of cilia in development, because it doesn't take a sledgehammer to the entire structure," Caspary says. Exactly how Arl13b contributes to the function of cilia is unclear — it appears to be involved in protein transport needed for building cilia because when it is hyperactivated, cilia are longer. Caspary's and Anton's laboratories teamed up to look at neuronal migration in mouse embryos where Arl13b was deleted, but only in some types of neurons. "Interneurons" form connections between other neurons and do not connect to muscles or sensory organs. They observed that when Arl13b was deleted in interneurons, those cells did not migrate properly through the developing cortex of the brain. The team probed cilia by using mice that produced a red fluorescent protein within cilia. Slices of embryonic brain were examined with a confocal microscope, under conditions where the cells stay alive and continue migrating for several hours. The scientists could see the interneurons migrating in spurts, with the cilia tending to extend and move "like basketball players' arms" when the cells paused. 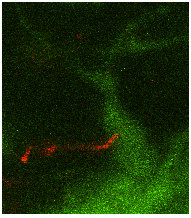 In the Arl13b deleted mice, the cilia did not extend as much and often could be seen only as red dots. Reintroducing Arl13b could rescue these defects, while a form of Arl13b found in Joubert syndrome patients could not. How defects in cilia contribute to Joubert syndrome is complex; cilia are needed for Hedgehog signaling, cellular machinery that controls embryonic patterning. Caspary says the neuron migration problem may explain the intellectual disability aspect, while Hedgehog defects may explain impaired development of the cerebellum and brainstem. The research was supported by the National Institute of Mental Health (MH060929) the National Institute of Neurological Disorders and Stroke (NS056380), and the Brain and Behavior Research Foundation (formerly the National Alliance for Research on Schizophrenia and Depression). H. Higginbotham, T.Y. Eom, L.E. Mariani, A. Bachleda, J. Hirt, V. Gukassyan, C. Cusack, C. Lai, T. Caspary and E.S. Anton. Arl13b in primary cilia regulates the migration and placement of interneurons in the developing cerebral cortex. Dev. Cell 23, 1-14 (2012).